The Whispering Session. Sometimes these shows titles have meanings, but only to me. True story. Ricky Gervais sings at the end. I’m not kidding. It’s really humid and summery here, so something more beach balearic sounding for next week’s podcast, then back to a dark House mix to follow. 2010.11.04 Antidote presents Bugged: FREE MIX! You may remember a few months back Antidote hit the Dublin Friday night scene with a massive kick in the groin. Since then they have grown hugely into one of the hottest nights in Dublin with only the best electronic music around. Well in that time they have been raised a child down in the deep dark corners of the Mezz and he has finally grown to be a ….BUG! That’s right they have stuffed all the best drum and bass, dubstep and grime into his suitcase and he has taken the boat across the river liffey to the bright lights of the Twisted Pepper! Antidote presents BUGGED!! Will come to you for the first time tomorrow night (Thursday Nov.04) from the BASSment of the Twisted Pepper. 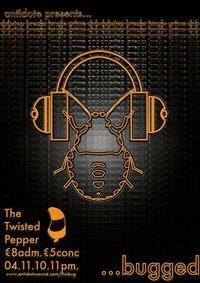 Get ready to enjoy the best in low frequencies and highly addictive wobble as Garret Moore ( Breakbeat & Jungle ), AV Kid ( Filthy Dubstep & Grime ), Proffesor Chaos ( DnB – Halftime – JumpUp ) take to the decks to literally rock the foundations in the Pepper. There are great drinks promotions all night and plenty to see throughout the club as all three floors are packed with music. This is set to be the best thing to see on the first Thursday of every month so dont miss it!!! And remember if you havn’t had enough you can always end your week with Antidote in the mezz on a Friday night! Wrap your ears around this mix and get on over to the facebook pages for more info! On this weeks show we dig deep into some of the tunes that made me fall in love with Dubstep and also break out a little with some of the new stuff i am feeling at the moment. Also, a word of warning, The Audio Files slides back to a show every two weeks as we march forward. Busy times in Shatterland mean i gotta slide things back. There needs to be some real world focus around releases, promoting some local nights and work. Hopefully when things level out we will kick it back up to an every week scenario. I like funny things too. Those exceeding synth beats, R’n’b female voices over end-of-the-world industrial chaos & J-pop dubstep are the perfect vaccine against christmas songs spreading all over the world right now, by filling all the sound spectrum with their apocalyptic entertainement. You can subscribe now to the ever growing Tellings community on the show’s Facebook page, and every 2 weeks you will be granted of even more sound respect for your own ears ! The show will return after the visit of people from Laponia and the marvellous events celebrating the world going 2010. Only 2 more years to go, guys ! For this week, we took a little round in the cemetery with outta-grave speaking ghosts and 6 feet under low frequencies from some Bristol sorcerers… unless you had prepared the sweeties ? Listen again here in high quality. Corkscrew maneuvering this week. Point A to C to 7 to #. Will it work? maybe. Was it fun? oh yes.